…Roger Fry, 42, is worried. He hasn’t been happy with the way his job with New York City’s Metropolitan Museum of Art has been working out. Five years ago, when he first met the Museum’s new president, financier J P Morgan, 72, he was impressed. Two years later, when Morgan chose him over noted art historian Bernard Berenson, 44, to be curator of European painting, he was thrilled. Initially Fry had enjoyed traveling with the ‘Big Man’ throughout Europe on art-buying excursions, and even the frequent trips to New York. He’d met Mark Twain! But last year he decided that the travel was wearing him down. His wife, Helen, 45, was ill, and Fry had convinced the museum to reassign him as ‘European adviser’ so he could spend most of his time at home in London. And now Fry’s suspicions about his wealthy American boss have been confirmed. Fry had negotiated a low price for a fabulous piece of Italian sculpture on the basis that it was going to the Metropolitan Museum. He has just found out that Morgan bought it for his own collection. At the reduced price. Fry suspects this has happened before. He knows what he has to do. Fry has to tell one of the members of the Museum’s board of trustees. And he knows Morgan will have him fired. 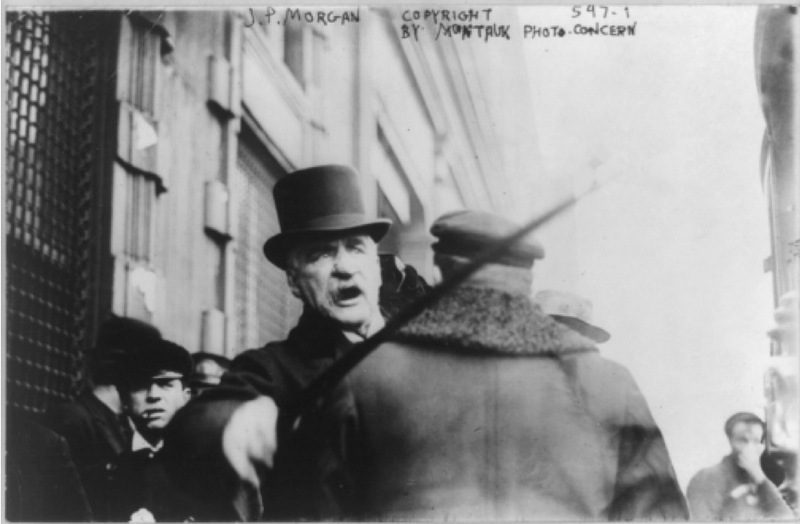 J P Morgan attacking a paparazzi in 1909. Morgan rarely allowed himself to be photographed because he suffered from rosacea which made his nose appear purple. Clive Bell, 25, Cambridge graduate, from a good family, has been proposing to Vanessa Stephen, 27, for months now. No, no, no, has been the answer. Clive has been doing his best to ingratiate himself into the circle of her friends and family, including her sister Virginia, 24, and brothers Adrian, 23, and Thoby, 26. But just two days ago, big, healthy, strapping, incredible Thoby, died. Ever since the Stephen siblings came back sick from a disastrous European tour, the doctors have been treating Thoby for malaria. But he was suffering from typhoid. The Stephens and all his Cambridge friends are devastated. Clive isn’t sure whether Thoby’s death has influenced Vanessa’s change of heart. All he knows is, she said yes. …Leonard Woolf, 25, feels as though he will never adjust to his life as a cadet in the British civil service, assisting the Government Agent here. In the past two years, he has survived typhoid, lost his virginity to a local prostitute, and carried on an affair with one of the women in the expat Brit community. …English painter Duncan Grant, 21, is living in Paris. When his aunt gave him £1000 for his birthday in January, he knew exactly what he wanted to do with it. He has brought along his cousin and current lover, essayist Lytton Strachey, just turned 26, but the relationship is not going well. They’ve mostly spent time hanging out with English friends and relatives. Trying to make connections within the art world, Duncan is studying with painter Jacques-Emile Blanche, 45, and has visited the most talked-about art show, the Salons des Independents, but didn’t notice anything in particular. American ex-patriate siblings, Leo, 33, and Gertrude Stein, 32, have also visited the exhibit. 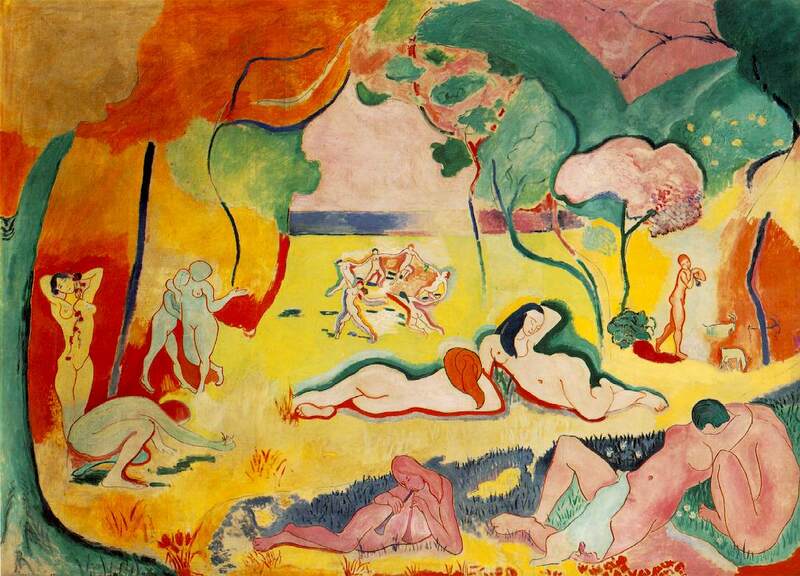 They were thrilled to hear about the scandal surrounding The Joy of Living [Bonheur de vivre] by their friend, Henri Matisse, 36. They started buying up his paintings last year and are planning to invite him to their salon at 27 rue de Fleurus on the Left Bank to introduce him to one of their other favourites, Pablo Picasso, 24. She’s been sitting with him for her portrait. 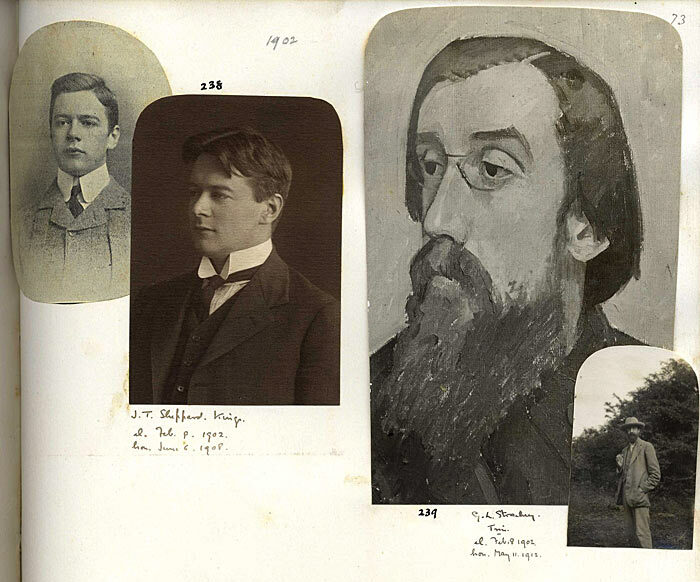 …Lytton Strachey, 21, has returned to Trinity College. He’s looking forward to reading his new essay, ‘Christ or Caliban?’ for the weekly debate at the Apostles’ meeting. He was thrilled to have been elected to the university’s ‘secret’ society, and has met the most interesting men there. 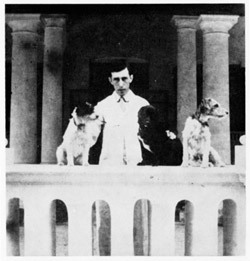 His friend Leonard Woolf, also 21, takes the group very seriously. 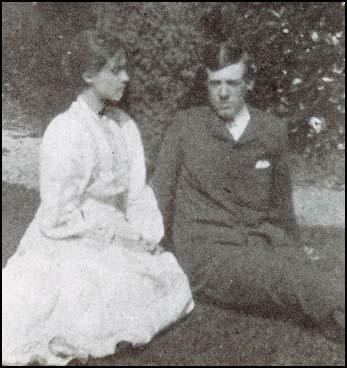 And the new guy, John Maynard Keynes, 19, from King’s College, is…very attractive. Vanessa Stephen, 25, and her brothers Thoby, 24, and Adrian, 21, are packing up and movin’ out. Their sister Virginia, 22, has been shipped off to family friends so she won’t lapse into any of her ‘fits’ and disrupt the process. Vanessa is in charge of this whole project, convincing her siblings that, now that their father had died, just months before, they’re entitled to their freedom. And that means getting out of this ‘house of all the deaths,’ as family visitor Henry James, 61, had referred to it. The Stephen relatives are absolutely scandalized by the decision. Moving is one thing, but to Bloomsbury! That dirty, congested Bohemian neighbourhood. What on earth has come over Vanessa?! But Vanessa knows what she wants. She found #43 Gordon Square, negotiated a lease, and is organizing and moving the whole household of 11 Stephens and seven servants. 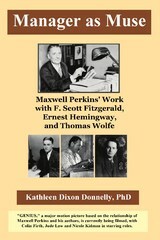 …Manager as Muse: Maxwell Perkins’ Work with F. Scott Fitzgerald, Ernest Hemingway and Thomas Wolfe is published. This is the traditional view of Perkins’ work with his three most famous authors, F. Scott Fitzgerald, Ernest Hemingway and Thomas Wolfe. However, when it came time for me to choose a topic for my thesis at Duquesne University in Pittsburgh, PA, I wanted to find out how he managed to get such incredible work out of these fabulous characters. The terrific 1980s biography, Max Perkins: Editor of Genius, by Pulitzer-prize winning author A. Scott Berg, gave me a sound basis to build on. But I also drew on many other sources about editors, publishing, and creative people. Quite a bit came from collections of letters between the editor and his authors. People wrote letters in those days! They provide a wealth of information. Berg’s book is currently being made into a film, Genius, starring Colin Firth as Perkins, Jude Law as Wolfe, and Nicole Kidman as Wolfe’s mistress, Aline Bernstein. The film has been shooting now in the UK and is scheduled to be released later this year or early in 2016. 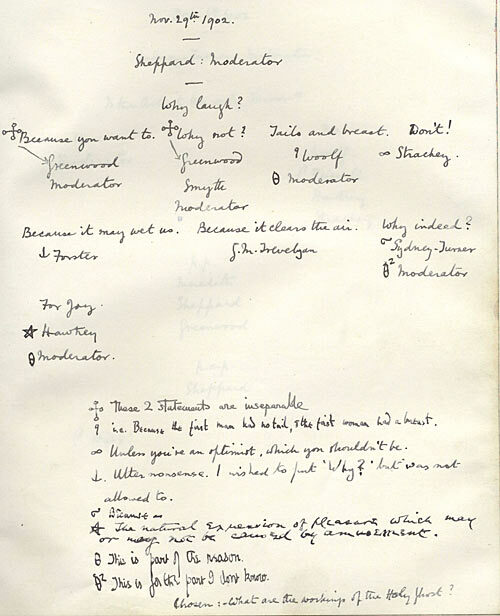 After researching Perkins and that time period, when it came time to do my Ph.D. in Communications, at Dublin City University, I decided to build on the information I had and look into writers who socialized together, as Fitzgerald and Hemingway did in Paris in the 1920s with Gertrude Stein and others. Manager as Muse is now available in both print and Kindle versions on Amazon.com in the US and Amazon.co.uk in the UK. If you are in the UK and want a signed copy of Manager as Muse, let me know and I’ll arrange to get you one. If you are in the US, you can order the print version and I’m happy to sign it next time I’m there!